54″ Canoe Chandelier, beautiful wall or hanging canoe light! 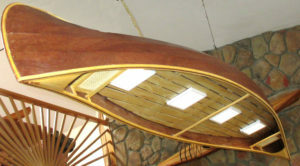 72″ Wood strip canoe chandelier. Just the right size! 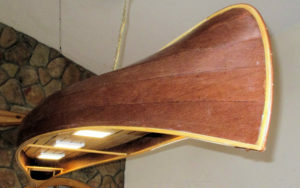 96″ Wood Strip Canoe Chandelier, The Gran Daddy of them all! canoemodelkitsOur BlogUncategorizedThe new Stitch & Glue Canoe Chandelier is finished! The new Stitch & Glue Canoe Chandelier is finished! I have designed a new stitch & glue canoe kit. There are many new and very interesting things about this one. First of all it all cut on the new CNC. There are 5 panels for each side assembled and stitched with copper wire over a set of Luan forms. It goes together easily and fast. About four or five hours and it will be taking shape. Then glue all the seams on the inside. This time i used my regular Titebond wood glue thickened with wood flour. This worked excellent! Strong, sands easy and the color is perfect. Once that dried overnight, I cleaned up the outside and pulled the copper stitches out, the epoxy and cloth the whole outside, though this could be skipped. I finished it out with heavier pine gunwales,seats and thwarts. The deck is cut on the router as well. The canoe was a lot of fun to build. Minimal sanding. I will be selling the completed lights as well as the kit. This is brand new so I have not started a new page for it. If you’re interested, drop me a line and I will set you up. Very pleased with how it came out. 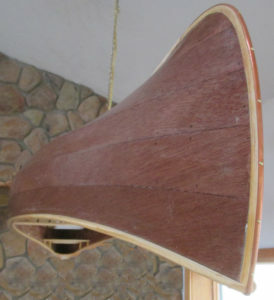 Used 1/8″ mahogany plywood. There will be a new page just for this kit. Comments can be left here. Canoe Model kits has grown from a small garage project to a large wood working facility producing beautiful small scale canoe and kayak models, lights and kits. Enjoyed by all ages and skill levels. New video about the canoe lights and how they are made. Will Lusby finishes his 36 canoe. Great Job! After much work, have the new CNC router in place and running. Lot of work!